The TC Electronic GAUSS Tape Echo is a delay pedal for electric guitarists. It provides a warm and fat tape-style echo that evokes a vintage era. The stompbox offers a simple 3-knob control set. Delay lets you dictate the timing of your echo, while Volume controls the output level of the effect. Sustain sets the number of repeats. If you want to introduce the classic effects of wow and flutter, you can do so via the Mod switch. A 1/4" instrument input and output path provides connections for your instrument. 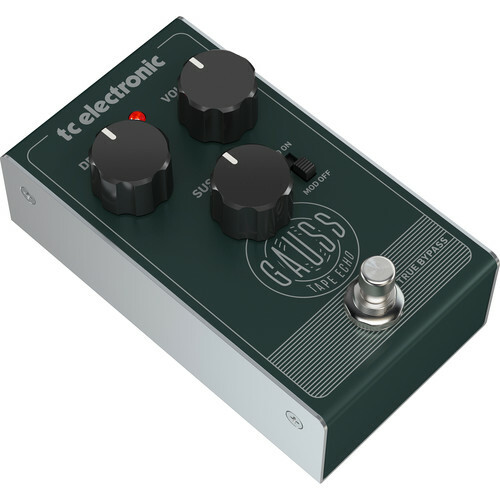 The GAUSS can be powered with a 9V battery or a PSU-SB DC power supply, both of which are available separately. The pedal utilizes all-analog circuitry and offers a true bypass footswitch, so that your signal remains pristine and unaffected when the pedal is disengaged. The GAUSS sports a rugged metal frame, so it can stand up to the rigors of the road.